Baile de California dancers have had a busy 2015 so far, and the fun is just beginning. 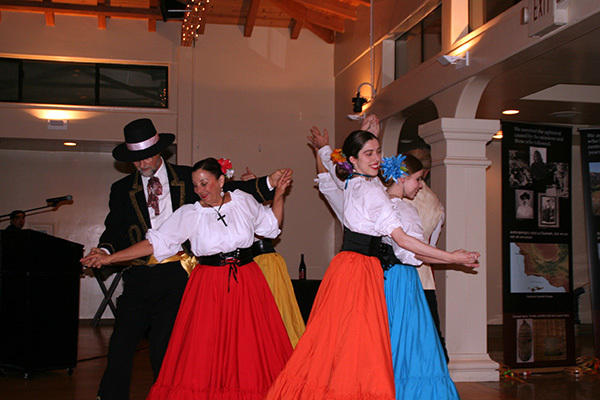 Old Spanish Days Fiesta will be here in less than a month! We started the year by performing at El Presidio Reál de Santa Bárbara’s, 1st Thursday event- Presidio Pastimes by Candlelight, February 5th. Audience participation is always a highlight of this evening. Presidio Pastimes was followed by performing at the California Mission Studies Association’s (CMSA) 32nd Annual Conference at Mission San Buenaventura and the historic Pierpont Inn. This conference is attended by Mission scholars throughout California as well as Mission scholars representing the American Southwest. Guests and the keynote speaker came from as far away as New York and Mexico. April was a full month, beginning by celebrating the city of Santa Barbara’s Founding Day at the city’s birthplace- El Presidio Reál de Santa Bárbara. This year the event encompassed three days and three big events. Despite (much needed) sprinkles, Saturday’s Founding Day Reenactment went on without a hitch. After the Reenactment, Baile de California director, Diana Replogle-Purinton, was joined by two of the Flor y Canto String Ensemble musicians, director, Jim Garcia and guitarist, Michael Aberle, to teach California folk dance in the Presidio Chapel. 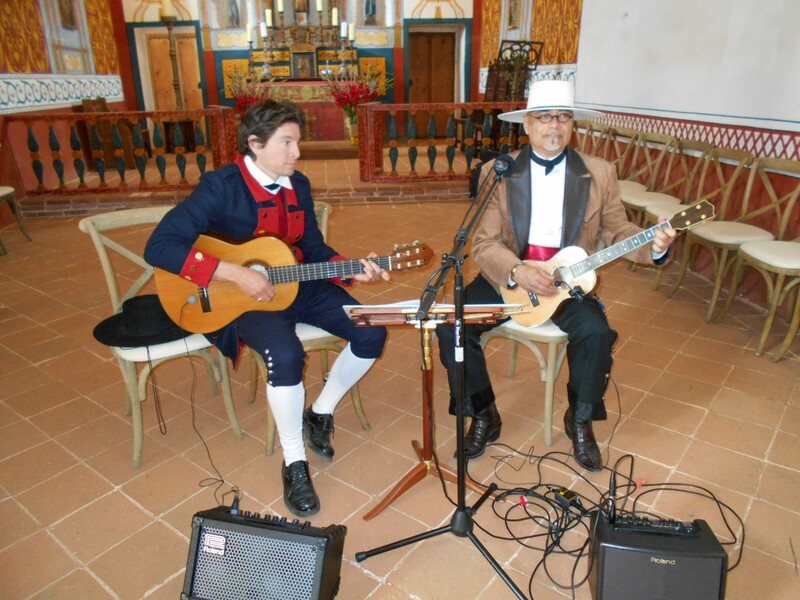 Guitarist Michael Aberle and Flor y Canto String Ensemble director, Jim Garcia, PhD provided the musical accompaniment to teach California folk dances to Founding Day Festival guests. April ended and May began celebrating National Dance Week and locally, the 26th Annual Fair & Expo at Earl Warren Showgrounds. (See our Facebook® page for Fair photos.) This year’s theme- “Let’s Get MOOving” fit us to a “T.” We got the crowd up and “MOOving” when we invited them to join us for “new” California folk dances, the Twist, Pony, and the Swim, to the Beach Boys’ hit- Surfin’ USA. Baile de California’s mission is to celebrate California’s unique cultural heritage and surf music is definitely a part of that. Next up, as hinted at, at the beginning of this post, is Santa Barbara’s 91st Old Spanish Days Celebration. 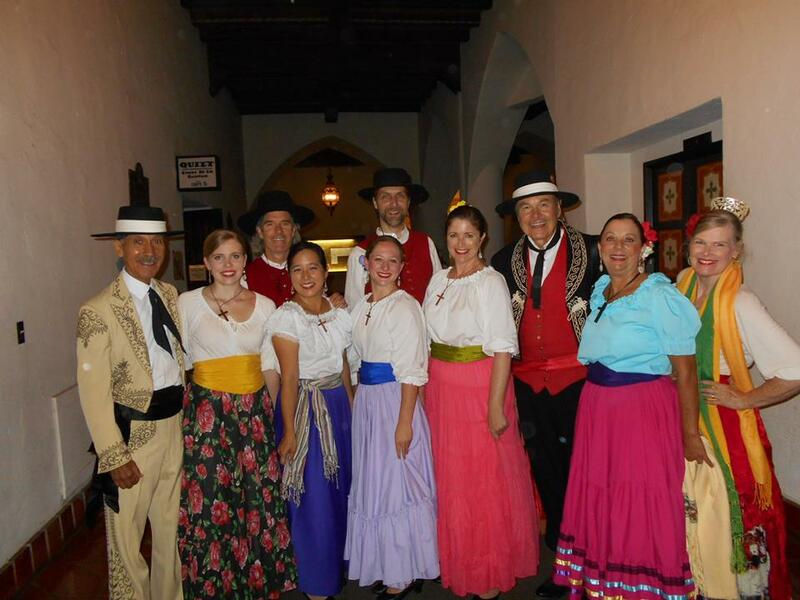 Commonly referred to as “Fiesta,” Baile de California will be featured at Flor y Canto, Friday night, Aug. 7th, at the Courthouse Sunken Gardens, 7-8 pm. We will also be dancing at El Mercado del Norte (MacKenzie Park) on Thursday, 8/6 at 2:00 pm and Saturday, 8/8 at 11:35 am. We hope to be included in multiple nights of Las Noches de Ronda, also at the Courthouse Sunken Gardens and will be doing community outreach by appearing at nursing facilities. It is NOT too late to join the fun at Fiesta 2015! Many of our dances are folk dances, the dances enjoyed by the common folks, both dancers and non-dancers, of ALL ages and ALL abilities. BdC exists to celebrate and enjoy California’s history and not to perfect it. Come join the dance and join the fun!